Despite what you might imagine, the United States Postal Service is actually doing pretty well for itself. Sure, we don’t send a lot of letters anymore, but we definitely order more packages than ever before. You might want to rethink your pen pal status, though, since the post office just announced that it’s launching a set of scratch-and-sniff stamps, and we really don’t understand why they didn’t think of this before. Go grab your favorite stationery and a pack of these stamps and get to writing to your BFFs like you did in the good old days! There are so many things to love about this set. First of all, according to a USPS press release, the set is called “Frozen Treats Forever” — how great is that? It will be available on June 20th. Also, the 20-stamp collection features 10 different frozen desserts and popsicles. And they’re not just adorably cute and fragrant — they’re also crafted by a female artist, Margaret Berg, which is always cause for celebration. The Postal Service is launching the booklet at the Thinkery Children’s Museum in Austin, Texas, though the stamps will also be available online before then. 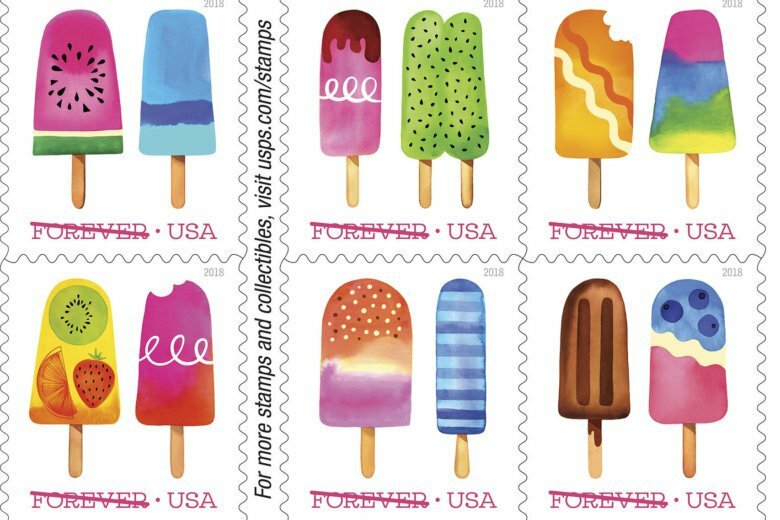 The post office wants you to show off the stamps on social media, too, using the hashtag #FrozenTreatsForever. Expect to see them all over your timeline come July. "Today, Americans love cool, refreshing ice pops on a hot summer day. The tasty, sweet confections come in a variety of shapes and flavors. Ice pops are made by large manufacturers, home cooks and artisanal shops. In recent years, frozen treats containing fresh fruit such as kiwi, watermelon, blueberries, oranges and strawberries have become more common. In addition, flavors such as chocolate, root beer and cola are also popular. Some frozen treats even have two sticks, making them perfect for sharing." Whether you add them to your stamp collection for safekeeping or use them to send love letters to all of your long-distance besties, these scratch-and-sniff stamps are worth a trip to the post office.